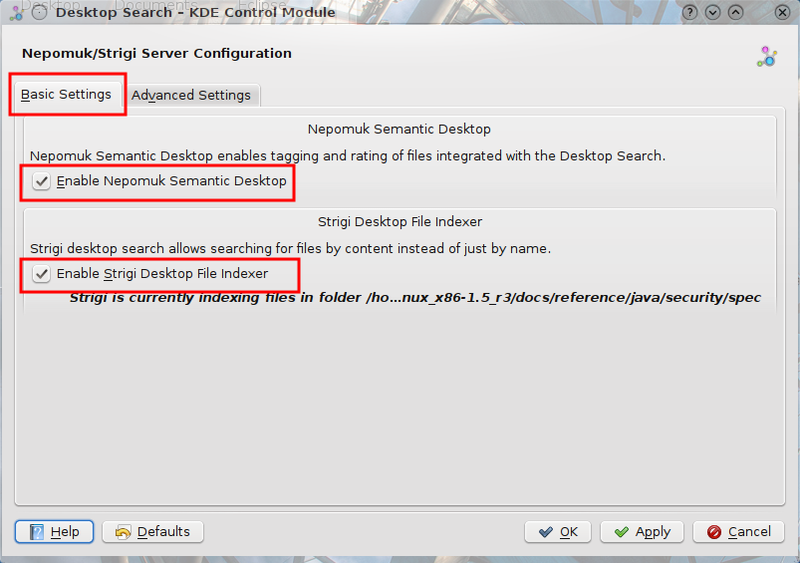 Nepomuk/Strigi is a very powerful desktop search in KDE. Strigi is the file indexer which allows for search not just by the file name but by the content of the file as well and Nepomuk is allows for the tagging and rating of the files and it is integrated along with the desktop search. Press "Alt+F2" to launch KRunner. Enter Strigi in KRunner and run Desktop Search. 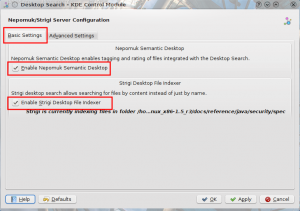 In the Desktop Search Control Module, under the Basic Settings tab, check both the check boxes next to Enable Nepomuk Semantic Desktop and Enable Strigi Desktop File Indexer. Now you will get to know if you are running OpenJDK Runtime Environment or Sun Java Runtime Environment. As you can see from the screenshot below, I am running OpenJDK. After running running the command for either OpenJDK or Sun Java Runtime, click on Apply again and Strigi should be working now.